Holmium is a chemical element with symbol Ho and atomic number 67. Part of the lanthanide series, holmium is a rare earth element. Holmium was discovered by Swedish chemist Per Theodor Cleve. Its oxide was first isolated from rare earth ores in 1878 and the element was named after the city of Stockholm. Elemental holmium is a relatively soft and malleable silvery-white metal. It is too reactive to be found uncombined in nature, but when isolated, is relatively stable in dry air at room temperature. However, it reacts with water and rusts readily, and will also burn in air when heated. Holmium is found in the minerals monazite and gadolinite, and is usually commercially extracted from monazite using ion exchange techniques. Its compounds in nature, and in nearly all of its laboratory chemistry, are trivalently oxidized, containing Ho(III) ions. 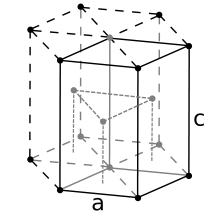 Trivalent holmium ions have fluorescent properties similar to many other rare earth ions (while yielding their own set of unique emission light lines), and holmium ions are thus used in the same way as some other rare earths in certain laser and glass colorant applications. Holmium has the highest magnetic permeability of any element and therefore is used for the polepieces of the strongest static magnets. Because holmium strongly absorbs neutrons, it is also used as a burnable poison in nuclear reactors. Holmium is a relatively soft and malleable element that is fairly corrosion-resistant and stable in dry air at standard temperature and pressure. In moist air and at higher temperatures, however, it quickly oxidizes, forming a yellowish oxide. 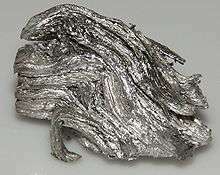 In pure form, holmium possesses a metallic, bright silvery luster. Holmium oxide has some fairly dramatic color changes depending on the lighting conditions. In daylight, it is a tannish yellow color. Under trichromatic light, it is a fiery orange red, almost indistinguishable from the appearance of erbium oxide under the same lighting conditions. The perceived color change is related to the sharp absorption bands of holmium interacting with a subset of the sharp emission bands of the trivalent ions of europium and terbium, acting as phosphors. B) of any naturally occurring element and possesses other unusual magnetic properties. When combined with yttrium, it forms highly magnetic compounds. Holmium is paramagnetic at ambient conditions, but is ferromagnetic at temperatures below 7001190000000000000♠19 K.
Holmium's most common oxidation state is +3. Holmium in solution is in the form of Ho3+ surrounded by nine molecules of water. Holmium dissolves in acids. Natural holmium contains one stable isotope, holmium-165. Some synthetic radioactive isotopes are known; the most stable one is holmium-163, with a half life of 4570 years. All other radioisotopes have ground-state half lives not greater than 1.117 days, and most have half lives under 3 hours. However, the metastable 166m1Ho has a half life of around 1200 years because of its high spin. This fact, combined with a high excitation energy resulting in a particularly rich spectrum of decay gamma rays produced when the metastable state de-excites, makes this isotope useful in nuclear physics experiments as a means for calibrating energy responses and intrinsic efficiencies of gamma ray spectrometers. Holmium (Holmia, Latin name for Stockholm) was discovered by Jacques-Louis Soret and Marc Delafontaine in 1878 who noticed the aberrant spectrographic absorption bands of the then-unknown element (they called it "Element X"). The following year, Per Teodor Cleve independently discovered the element while he was working on erbia earth (erbium oxide). Using the method developed by Carl Gustaf Mosander, Cleve first removed all of the known contaminants from erbia. The result of that effort was two new materials, one brown and one green. He named the brown substance holmia (after the Latin name for Cleve's home town, Stockholm) and the green one thulia. Holmia was later found to be the holmium oxide and thulia was thulium oxide. In Henry Moseley's classic paper on atomic numbers, holmium was assigned an atomic number of 66. Evidently, the holmium preparation he had been given to investigate had been grossly impure, dominated by neighboring (and unplotted) dysprosium. He would have seen x-ray emission lines for both elements, but assumed that the dominant ones belonged to holmium, instead of the dysprosium impurity. Like all other rare earths, holmium is not naturally found as a free element. It does occur combined with other elements in gadolinite (the black part of the specimen illustrated to the right), monazite, and other rare-earth minerals. The main mining areas are China, United States, Brazil, India, Sri Lanka, and Australia with reserves of holmium estimated as 400,000 tonnes. Holmium makes up 1.4 parts per million of the earth's crust by weight. This makes it the 56th most abundant element in the earth's crust. Holmium makes up 1 part per million of the soils, 400 parts per quadrillion of seawater, and almost none of earth's atmosphere. Holmium is rare for a lanthanide. It makes up 500 parts per trillion of the universe by weight. It is commercially extracted via ion-exchange from monazite sand (0.05% holmium) but is still difficult to separate from other rare earths. The element has been isolated through the reduction of its anhydrous chloride or fluoride with metallic calcium. Its estimated abundance in the Earth's crust is 1.3 mg/kg. Holmium obeys the Oddo-Harkins rule: as an odd-numbered element, it is less abundant than its immediate even-numbered neighbors, dysprosium and erbium. However, it is the most abundant of the odd-numbered heavy lanthanides. The principal current source are some of the ion-adsorption clays of southern China. Some of these have a rare-earth composition similar to that found in xenotime or gadolinite. Yttrium makes up about two-thirds of the total by weight; holmium is around 1.5%. The original ores themselves are very lean, maybe only 0.1% total lanthanide, but are easily extracted. 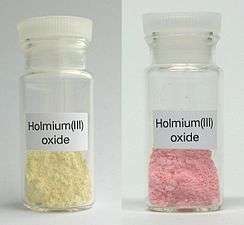 Holmium is relatively inexpensive for a rare-earth metal with the price about US$1000 per kg. Holmium has the highest magnetic strength of any element, and therefore is used to create the strongest artificially generated magnetic fields, when placed within high-strength magnets as a magnetic pole piece (also called a magnetic flux concentrator). Since it can absorb nuclear fission-bred neutrons, it is also used as a burnable poison to regulate nuclear reactors. Holmium is used in yttrium-iron-garnet (YIG)- and yttrium-lanthanum-fluoride (YLF) solid-state lasers found in microwave equipment (which are in turn found in a variety of medical and dental settings). Holmium lasers emit at 2.1 micrometres. They are used in medical, dental, and fiber-optical applications. Holmium is one of the colorants used for cubic zirconia and glass, providing yellow or red coloring. Glass containing holmium oxide and holmium oxide solutions (usually in perchloric acid) have sharp optical absorption peaks in the spectral range 200–900 nm. They are therefore used as a calibration standard for optical spectrophotometers, and are available commercially. The radioactive but long-lived Ho-166m1 (see "Isotopes" above) is used in calibration of gamma ray spectrometers. Holmium plays no biological role in humans, but its salts are able to stimulate metabolism. Humans typically consume about a milligram of holmium a year. Plants do not readily take up holmium from the soil. Some vegetables have had their holmium content measured, and it amounted to 100 parts per trillion. Large amounts of holmium salts can cause severe damage if inhaled, consumed orally, or injected. The biological effects of holmium over a long period of time are not known. Holmium has a low level of acute toxicity. 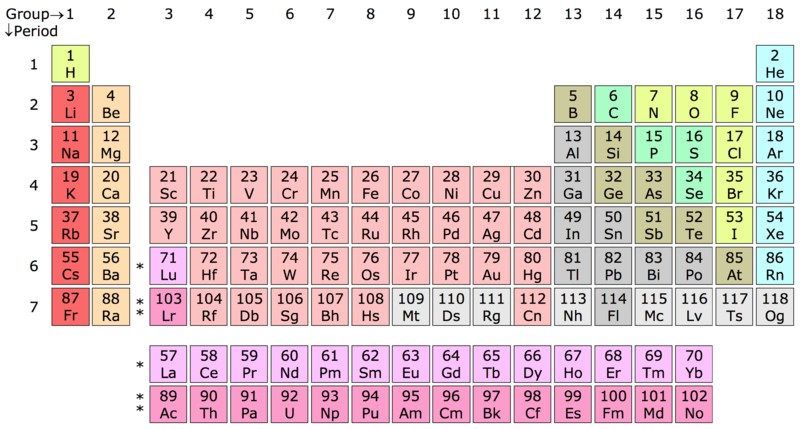 Interactive imagemap of the periodic table of chemical elements. Hover your mouse over an element in the table to see its name, and click to link to its article. ↑ Yiguo Su; Li, Guangshe; Chen, Xiaobo; Liu, Junjie; Li, Liping (2008). "Hydrothermal Synthesis of GdVO4:Ho3+ Nanorods with a Novel White-light Emission". Chemistry Letters. 37 (7): 762–763. doi:10.1246/cl.2008.762. 1 2 C. K. Gupta; Nagaiyar Krishnamurthy (2004). Extractive metallurgy of rare earths. CRC Press. p. 32. ISBN 0-415-33340-7. ↑ Jiles, David (1998). Introduction to magnetism and magnetic materials. CRC Press. p. 228. ISBN 0-412-79860-3. ↑ "Chemical reactions of Holmium". Webelements. Retrieved 2009-06-06. 1 2 Emsley, John (2011). Nature's Building Blocks. ↑ Jacques-Louis Soret (1878). "Sur les spectres d'absorption ultra-violets des terres de la gadolinite". Comptes rendus de l'Académie des sciences. 87: 1062. ↑ Jacques-Louis Soret (1879). "Sur le spectre des terres faisant partie du groupe de l'yttria". Comptes rendus de l'Académie des sciences. 89: 521. ↑ Per Teodor Cleve (1879). "Sur deux nouveaux éléments dans l'erbine". Comptes rendus de l'Académie des sciences. 89: 478. ↑ Per Teodor Cleve (1879). "Sur l'erbine". Comptes rendus de l'Académie des sciences. 89: 708. 1 2 3 John Emsley (2001). Nature's building blocks: an A-Z guide to the elements. US: Oxford University Press. pp. 181–182. ISBN 0-19-850341-5. ↑ Emsley, John (2011). Nature's Building Blocks. Oxford University Press. 1 2 C. R. Hammond (2000). The Elements, in Handbook of Chemistry and Physics (81st ed.). CRC press. ISBN 0-8493-0481-4. ↑ Patnaik, Pradyot (2003). Handbook of Inorganic Chemical Compounds. McGraw-Hill. pp. 338–339. ISBN 0-07-049439-8. Retrieved 2009-06-06. ↑ James B. Hedrick. "Rare-Earth Metals" (PDF). USGS. Retrieved 2009-06-06. ↑ R. W. Hoard; S. C. Mance; R. L. Leber; E. N. Dalder; M. R. Chaplin; K. Blair; et al. (1985). "FIELD ENHANCEMENT OF A 12.5-T MAGNET USING HOLMIUM POLES". Ieee Transactions on Magnetics. 21 (2): 448–450. Bibcode:1985ITM....21..448H. doi:10.1109/tmag.1985.1063692. ↑ Wollin, T. A.; Denstedt, J. D. (Feb 1998). "The holmium laser in urology". Journal of clinical laser medicine & surgery. 16 (1): 13–20. PMID 9728125. ↑ "Cubic zirconia". Retrieved 2009-06-06. ↑ R. P. MacDonald (1964). "Uses for a Holmium Oxide Filter in Spectrophotometry" (PDF). Clinical Chemistry. 10 (12): 1117–20. PMID 14240747. ↑ "Holmium Glass Filter for Spectrophotometer Calibration". Retrieved 2009-06-06. ↑ Ming-Chen Yuan; Jeng-Hung Lee & Wen-Song Hwang (2002). "The absolute counting of 166mHo, 58Co and 88Y". Applied Radiation and Isotopes. 56: 424. doi:10.1016/S0969-8043(01)00226-3. Wikimedia Commons has media related to Holmium. Look up holmium in Wiktionary, the free dictionary.